Let's start with some defining statements and then explore Absorptive Capacity, as it has an important role to play in innovation. Innovation is dependent on becoming aware of known external ideas and innovations in the market. Alternatively, innovation can come suddenly out of piecing together strands of thought, which form into something radically different, unknown to the world until now. We can fall over these, or we can find ideas or concepts through explicit search. We then have the harder job of transforming these ideas into something different that brings new value or novelty. Establishing a diffusion and dissemination process is crucial. In most cases, this will happen within the idea management system you've deployed—or certainly should deploy. Developing these processes as a sustaining system provides an essential source for building an organization's capabilities and competencies. It becomes your source or knowledge stock. By gathering, exploring, and exploiting new knowledge, the more we enhance and multiply its value from a single idea into the potential for multiple innovations. Absorbing knowledge feeds our innovation ideas. Having a systematic framework can dramatically transform random thoughts or observations into valuable concepts that advance your innovation potential. The issue is how we set about adopting and adapting new knowledge. Each organization collects its knowledge in different ways. Each has unique characteristics, systems, and methods of going about doing this. Finding the knowledge is often random. In many cases, the knowledge we are searching for already resides in the organization. Sometimes, going outside of our organization sends us on a path that leads us right back inside our organization. When this happens, we're often left puzzled and wonder why there was no system of record. Below, we'll introduce the AC/DC model to understand this concept better. AC/DC, as you might be aware, is an abbreviation for two types of electrical currents where AC stands for "Alternating Current" and DC stands for "Direct Current." The AC/DC model was extracted and adapted from the report entitled “Innovation by Adoption,” published by NESTA in October 2008. …the AC/DC abbreviation, which refers to "Absorptive Capacity" (AC) and "Development Capacity" (DC), was chosen deliberately to reflect the role of innovation as a power provider to the economy. But, there is another analogy between electrical and innovation currents: while "Direct Current" (DC), as its name suggests, always flows in the same direction with an increasing or decreasing order, "Alternating Current" (AC) flows one way, then the other way, continually reversing direction. Knowledge generation in a territorial innovation system has similar characteristics. Absorptive capacity is like "Alternating Current. It allows knowledge to flow in different and reverse directions. Accordingly, the innovation capacity of places combines two broad sets of capacities: their absorptive and development capacity. 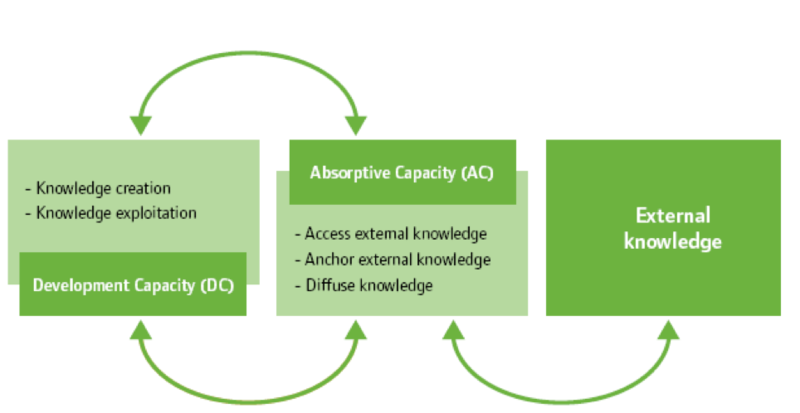 The conceptual and analytic framework presented in Figure 2 combines both the absorptive capacity (AC) of places to identify, value, and assimilate potentially profitable external knowledge and the development capacity (DC) of places to develop and exploit such knowledge. The traditional focus on innovation capacity has assumed that most of the knowledge needed for innovation will be found internally. A more modern view emphasizes the importance of harnessing external knowledge to improve individual firm innovation capacity. Innovation through adoption is thus an important channel of innovation. External knowledge that flows into a firm can translate into one or more outputs: 1) the creation of new innovation; 2) the creation of new knowledge; or 3) new economic and social value. Thus, new value can be a direct or indirect outcome. The process of innovation comes through the adoption of external knowledge. Absorptive Capacity poses significant challenges to the firm. How to deal effectively with the absorption of knowledge determines its innovative ability and attractiveness for a learning environment. Researchers pioneered the concept of absorptive capacity in the early 1990s. Since the concept's inception, researchers developed it further, giving rise to thousands of published papers around this subject. The initial definition offered here is an ideal starting point to appreciate absorptive capacity. "Absorptive capacity, the ability of a firm to recognize the value of new, external information, assimilate it, and apply it to commercial ends is critical to its innovative capabilities. Its a function of the firm's prior knowledge." The value of absorptive capacity is that when organizations have some prior knowledge, usually externally stimulated, they are more receptive to adding new understandings and new ideas. Organizations that encourage and set about learning are very aware. They are vigorously looking for new ideas. Having already established learning equips them to absorb new knowledge or quickly associate thoughts. They then seek out the meaning or the connections. These organizations are far better at recognizing new ideas that might lead to innovation. This encourages them to develop their understanding of connecting, integrating, and experimenting with this new knowledge. To encourage a firm to draw out learning and acquiring new knowledge, the more you can establish practices and norms the greater the potential. So, by having a robust idea management system in place, you are developing those common points of understanding. It becomes part of your routine and practice to contribute to your innovation's development. This gaining of continuous knowledge encourages constant learning. This has a positive feedback cycle as it builds the capacities and capabilities for future innovation activity. 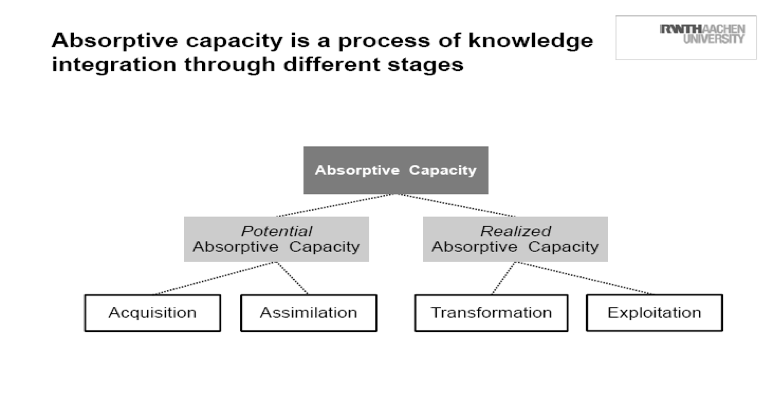 Absorptive capacity, once recognized and established as a system, promotes the search for new knowledge that increases the ability to make the necessary new connections for innovation to happen. For this to happen, it does need continuous focus—a system designed to absorb. If organizations take the alternative route of not providing structures and wanting to squeeze every last drop out of the existing innovation activity or research department, they will, over time, develop as bad learners. Organizations that do this begin to assume they have the knowledge and become fixed in their mindsets. They fail to absorb, they tend to reject, and they take on the "not invented here" syndrome. That can only last for a limited time before innovation decay sets in and people leave, taking their knowledge with them. The other vital part of understanding absorptive capacity is its terrific benefits for diffusion and dissemination of ideas. As the knowledge we glean from outside comes inside, it can suddenly confront us; it can challenge what we know, and we might simply reject it. It's at these moments that we must stop the initial reaction of "let's reject this" and allow time for a deeper evaluation, making sense from this different perspective. Looking through alternative lenses helps here. And sharing these ideas or new knowledge streams with others can catalyze "collective thinking." Again, the idea management system allows this to be the conduit. Organizations design innovation pipelines to get narrower and narrower. They want to dismiss ideas quickly that don't fit their norm. The system is poorly equipped to handle different, more challenging thinking, yet this is the very place where radical, breakthrough, and disruptive innovation sits. 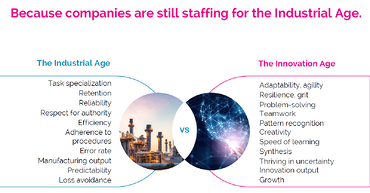 Organizations must find better ways to resist allowing knowledge pathways to become narrower before the knowledge, insights, and potential connections have been well absorbed. Providing greater access to new sources of knowledge and emerging innovation concepts increases real connections where something remarkably different and existing appears. We need to stop the "cognitive blinders"—ones that we can so often fall into the trap by believing we know, when we actually don’t. It is through opening up that we add additional insights and knowledge. We must equally avoid the stifling of different concepts or knowledge. We should give them full visibility and expression, so it encourages a more open environment to work on those concepts. We should push to explore knowledge. One step is to consciously make innovation far more open—inside the organization as well as outside. Practicing a more holistic open innovation is highly valuable for pushing beyond the current incremental approaches because knowledge often only resides with a few chosen people. And, it is the power of connecting that rapidly builds our understanding to create something that becomes powerful, valuable, and new to the world. We need to avoid cognitive traps to encourage the flow of knowledge. The best position is to adopt open innovation internally as well as externally this newly acquired knowledge to flow and be absorbed. Then, we can better translate this knowledge into new application or worth. There are many significant roadblocks in pursuing open innovation today that need resolution, but it is freely sharing knowledge that can often break down barriers and build identification. Knowledge and innovation are connected at the hip. They are inseparable. They give us movement to be creative, but they need all of the connective tissue. To separate knowledge from innovation would stop them from combining and achieving something different. One feeds the other. It is through the application of approaching them through a system like absorptive capacity that you can generate the flows needed to keep our search for new ideas stimulated, our innovations pushing forward, and allow others to benefit and build on this knowledge further. If you have not taken absorptive capacity and its value into account, it is high time you did. It might be your missing link as you consider if there is value in employing an idea management system. The AC/DC model was extracted and adapted from the report entitled "Innovation by Adoption," published by NESTA in October 2008. The full report where this was drawn from was written by Sami Mahroum (NESTA), Rob Huggins (University of Wales Institute in Cardiff), Naomi Clayton (The Work Foundation), Kathy Pain, and Peter Taylor (Loughborough University – GaWC).